Use the Import>Surfaces function to import bi-cubic, NURB, Offset and Tapered Offset, and trimmed/untrimmed surfaces. Note that only surface files that had been written (exported) using the Export>Surfaces function can be read in using this method. 1. 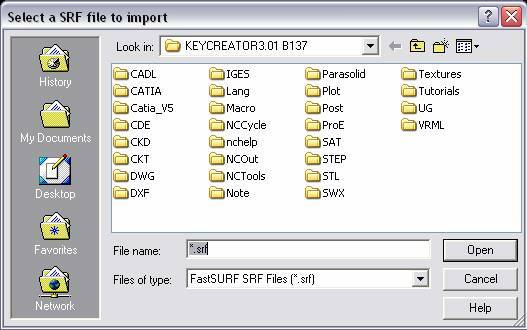 Select FastSURF Surface from the File>Import submenu. 2. The Import Surfaces dialog appears, through which you are able to specify a .SRF file to import. 3. Specify a file to import and select OPEN. The program will then attempt to import the specified file. To exit this dialog, click CANCEL.